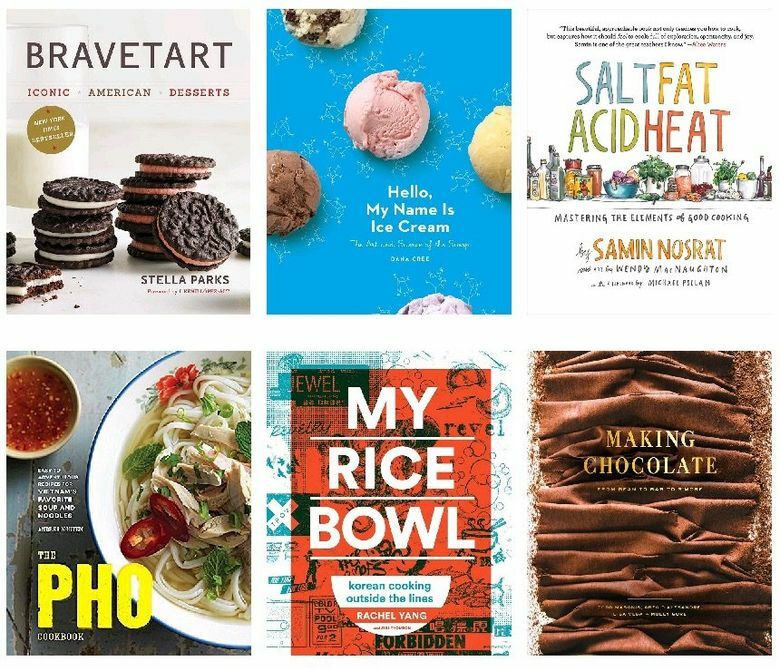 2017 was a great year for cookbooks. These are just a few of the ones we recommend. So many cookbooks, so little shelf space. How do you choose which cookbook is worth keeping? Cookbooks with a few great recipes can be passed on after those recipes are copied onto recipe cards. What we’re looking for now are the keepers — the books you’ll cook from for years to come, the ones that teach you and elevate your abilities, the ones you won’t post to your Buy Nothing group in January along with your extra spiralizer and the stocking-stuffer avocado pitter. Fortunately, 2017 turned out to be an extraordinarily good year for keeper cookbooks. The recipe was supposed to be dead (that’s what chef Tyler Florence told audiences at a Seattle tech summit), online searches were supposed to replace cookbooks (every year they say it’s really happening), and yet every month also brought in several titles that earned a long-term place on my kitchen bookshelf. Why? Well — the online revolution seems to be raising the bar for cookbooks rather than eliminating them. “Cookbook lovers and cooks are demanding more,” said Jenny Hartin, cookbook promotions manager for eatyourbooks.com, an online community and recipe index with more than 160,000 members. Readers are looking for inspiration and innovation that goes beyond the basics, she said. And, in this economy, buyers expect cookbooks to be as spectacular as their hefty price tags. More than before, they are. “The production value of the books is finally catching up with the quality of the written content,” said Lara Hamilton, owner of The Book Larder cookbook store. Also, cookbooks from professional chefs haven’t always been reliable, but many of them now work with serious recipe developers and provide trustworthy recipes. Sounds great. But keeper cookbooks are very individual choices too, and every kitchen has room for only so many. Here’s my best advice for maintaining a keeper collection in your own kitchen … and 2017 candidates for everyone on your gift list. The library is your friend: I check books out from Seattle Public Library for test runs. Usually that satiates my interest or reference needs. If I’m still using it when the overdue fees begin, it’s time to buy. This year, the library is also an option for the many bakers who don’t have $625 to shell out for Modernist Bread, the new 52-pound magnum opus from The Cooking Lab (full disclosure, I was an editorial contributor). All six volumes are available for in-library use at the Central Library, though it might take you all of 2018 to read through them that way. Nostalgia is your enemy: Ahem, does this cookbook still spark joy? With very few exceptions (attn: family heirlooms) it’s OK to boot out cookbooks that hold only sentimental value. Take a photograph of the cover; it’ll give you the same warm feelings and take up less space. Your keepers are not everyone else’s: You’d recognize plenty of the cookbook classics in my permanent collection. But some of them are peculiar to me: “Brittles, Barks and Bonbons,” by Charity Ferreira, a slim 2008 hardcover that looks like an impulse purchase, is a clear, useful guide to making easy candies. I’ve chucked plenty of grander, more exhaustive or big-name cookbooks while keeping room for that one. Even some keepers have an expiration date: A book can serve you well for five, 10, even 20 years, and you’re still allowed to pass it on if you find you’ve gotten all you can from it. No moral judgments here, just consider the rest of your household: While I’d like to boot “Best Mug Cakes Ever,” by Monica Sweeney (W.W. Norton, $14.95), my oldest child’s favorite for 2014 and 2015, when I sneaked it onto a donation pile this year my middle child rescued it and became completely enamored. It’s back on the keeper shelf under his protection, where it’ll stay as long as it earns its place … or until I can spirit it away without their younger sister laying her own claim. Looking for keeper cookbooks for holiday gifts? 2017 was good for your list. For the sweet tooth:“BraveTart,” by Stella Parks (W.W. Norton & Co., $35). Thanks to Parks, innumerable cooks over Thanksgiving succeeded in baking their first pies, cakes and showstopper cookies. (We know because they posted photos on Twitter, and Parks seems as delighted as they are by their successes.) If knowledge is power, Parks is making dessert the mightiest part of the meal with her readable, deeply researched recipes for “iconic American desserts,” including origin stories and chemistry lessons. For ice cream fans:“Hello, My Name Is Ice Cream,” by Dana Cree (Clarkson Potter, $25). Cree, the much-decorated former pastry chef at Poppy, provides a mini master class in ice cream types and textures, plus recipes for producing scoop-shop-worthy flavors at home. For the Northwest restaurant-goer: Two high-quality, well-designed cookbooks practically beg you to re-create restaurant favorites at home. For fans of Seattle’s Relay Restaurant Group (Joule, Revel, Trove) try “My Rice Bowl: Korean Cooking Outside The Lines,” by Rachel Yang and Jess Thomson (Sasquatch Books, $35); those who crave the brunch favorites (those biscuits!) at Portland’s Tasty n Sons and Tasty n Alder will embrace “Hello! My Name Is Tasty,” by John Gorham and Liz Crain (Sasquatch Books, $29.95). For a beginner cook:“Salt, Fat, Acid, Heat,” by Samin Nosrat, with integral illustrations by Wendy McNaughton (Simon & Schuster, $35), offers an education in creating flavors, not just following recipes. For fans of Seattle’s favorite food (after salmon and teriyaki):“The Pho Cookbook,” by Andrea Nguyen (Ten Speed Press, $22). Your favorite pho place in town might turn out to be your own home, thanks to Nguyen’s always-reliable recipes. For your book group that actually reads the book: “The Cooking Gene,” by Michael Twitty (Amistad, $28.99). More cultural memoir than cookbook, this “Journey Through African American Culinary History in the Old South” is guaranteed to provoke needed conversations. For the local-seasonal table: “Six Seasons,” by Joshua McFadden with Martha Holmberg (Artisan, $35). Original flavor combinations that are spot-on for Seattle palates, from the guy credited (or cursed) with bringing us the kale Caesar. For those who spent 2017 worrying about America:“America The Great Cookbook,” edited by Joe Yonan (Weldon Owen, $40). Reminders of the country’s grand breadth and depth, with recipes from 100 of its “chefs and food heroes.” Proceeds go to the nonprofit No Kid Hungry. Featured figures include Oglala Lakota chef Sean Sherman, whose own book, “The Sioux Chef’s Indigenous Kitchen” (University of Minnesota Press, $34.95) provides rare and valuable insights into Native foods. For the ultimate chocolate fan:“Making Chocolate,” by Todd Masonis, Greg D’Alesandre, Lisa Vega & Molly Gore (Clarkson Potter, $40). The team behind San Francisco’s Dandelion Chocolate factory explains how to make your own at home. It’ll deepen your appreciation of your favorite confections even if you have no desire to personally crack, winnow and roast your own cocoa beans.